It’s a jewel or something. I don’t know. I’ve had an unlucky streak of reading several “meh” books lately. I don’t review books I didn’t like, but a couple of these weren’t bad. So, here’s the best of the “I liked it, but…” books. Just remember, it’s subjective. My like may be your love. 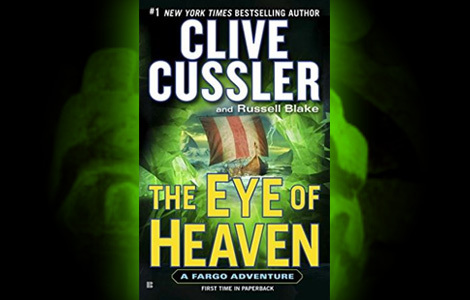 I haven’t read Clive Cussler for years, and for very good reasons. He has interesting story ideas, but some of the worst dialogue I have ever come across, and his character development is sketchy at best. Similar to James Patterson, and even the Tom Clancy line, he now has a private collection of co-writers. Like vintage wine, he sometimes pops the cork on one to share with his readers. I figured with someone else carrying the weight, the prose might improve. Enter: The Eye of Heaven. I’ve never read a “Sam and Remi” Fargo adventure, so this one sounded like a good enough place to start. For those not in the know, Sam and Remi Fargo are super-wealthy archeologists who pretty much go everywhere and do everything and everyone loves them. It’s a simple set-up that should lead to some serious Indiana Jones-type adventures. Right? The premise of The Eye of Heaven is an interesting mix of Viking and Toltec history and lore and how they may have crossed paths a thousand years ago. It begins with the discovery of a Viking longship buried in ice near Baffin Island. On board, our heroes discover chests loaded with Central American artifacts. That is, of course, unusual. What’s not unusual is some bad guys have caught wind of the find and they want in on the treasure that surely waits at the end of any good archeological quest. Let the race begin! Sam and Remi Fargo are fun and easy to like. The husband and wife team-up means the author(s) don’t have to waste a lot of pages building a quasi-romance that often feels forced and decidedly unromantic in adventure novels. The bad guys are bad enough without being complete cut-outs. The disagreements between the nefarious brothers on how to conduct business help build the characters and provide some dramatic highlights, if only briefly. Secondary characters are interesting enough as well, including a possible turncoat that the author manages to keep under wraps (though the reveal isn’t entirely surprising since there are only so many characters available). That said, the banter between Sam and Remi gets old quickly, as it’s not as amusing as the author(s) believe. It feels tacked on in more than a few chapters and not organic. While the bad guys are around, they don’t have much to do through large swathes of the story aside from appearing in the occasional chapter to remind the reader that they’re there and, darn it, they’re bad! In terms of the narrative itself, there isn’t nearly as much drive as there should be. It feels like the writer(s) want to portray the realistic side of archeology, which, as you may know, is pretty boring from a storytelling perspective. There isn’t a concerted build-up of action and there’s little suspense. The actual treasure everyone wants, the Eye of Heaven, doesn’t come across as that big of deal and almost makes you wonder why they’re bothering in the first place. And there is little in the way of unraveling the story of the Viking voyage to the Americas, which is why I wanted to read this in the first place. I’m not expecting reality, just some fascinating conjecture (it’s an adventure novel after all). To top it off, a surprising amount of time is devoted to detailing the Fargo’s expensive dinner and wine tastes, which do nothing to advance either the characters or the story. So, there you go. If you’re interested in Central American history and looking for a treasure hunt story, The Eye of Heaven might scratch that itch.